Unfortunately the same brand of ketchup we have been using for years has started causing me to have a soy reaction each time I eat even the tiniest amount. Although the label hasn’t changed and soy is not listed, it’s obvious that this ketchup does now contain soy… so ketchup has been added to that ever-growing list of foods that I have to make from scratch. Ketchup is amazingly easy to make. I usually make only a small batch at a time, but if you’re lucky enough to have lots of fresh tomatoes, larger batches of ketchup can also be processed in canning jars for longer-term storage. 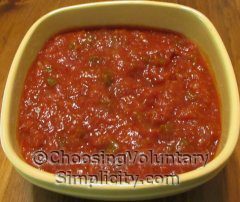 I start with a 28-ounce can of crushed tomatoes, or an equivalent amount of cooked-down fresh tomatoes and juice. The fresh tomatoes are nice, but not really necessary… canned tomatoes make really good ketchup. I mix in 2/3 cup of brown sugar, 1/2 cup of cider vinegar, and 1/2 teaspoon of salt. These ingredients are always a constant for this quantity of tomatoes because the vinegar and brown sugar cooked into the tomatoes is what gives ketchup its distinctive taste. Next come the flavorings. I usually vary the flavorings batch to batch. Today I used one medium onion, one small green pepper, three cloves of garlic, and three stalks of celery… all finely chopped. Sometimes I also add about a tablespoon each of celery seeds and mustard seeds. Next I let everything simmer together for at least an hour… or until the mixture has achieved a ketchup consistency. (We like a thick ketchup.) I taste the mixture as it cooks… if I think it needs more of something (like more garlic), I just add it in. Some people add cinnamon, cloves, coriander, allspice, bay leaves, or red pepper flakes. 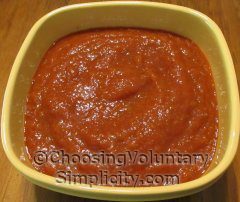 There are lots of ketchup recipes “out there,” but I have had really good results following the basic method I described above and adding flavorings to taste… always keeping in mind that all the flavors will intensify as the ketchup cools. I use my small food processor to puree the tomato mixture until it is smooth. An immersion blender or a regular blender works well, too. Ketchup made with a 28-ounce can of crushed tomatoes will yield approximately three cups of ketchup, depending on how much the tomato mixture has been cooked down. I have no idea how long an opened container of homemade ketchup will keep in the refrigerator, but I would not expect it to last as long as purchased ketchup, so when I make large quantities of ketchup, I keep only a small amount in the refrigerator and freeze the rest. Sometimes I even freeze ketchup in ice cube trays so I can take out the exact amount I will be using. Years ago I made my own ketchup and it was absolutely the best I’ve ever had. Deep rich flavor! This year we are making progress toward growing all of our own food, so with over one hundred tomato plants out, a big batch of ketchup is once again on my to do list for late summer. Thanks for the tips! Something else I didn’t know was possible. This is definitely something I want to try because we do have allergies in my family and another thing is we try to eat without additives. 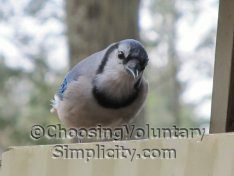 This is a really great blog with a wealth of information and interesting stuff. I want to thank you for the time it must take. Thanks for this. I have just discovered I am allergic to soy and I have missed ketchup terribly. I can’t believe that I can really make my own and with canned tomatoes too! That is so wonderful! I just love your blog. I check it every day and I always find something interesting. Thank you for all your hard work. I love this recipe. Thank you, I really enjoy your blog as well. Wonderful! No soy and no high fructose corn syrup. Thanks! We go thru ketchup like crazy at our house. Today we were out and I didn’t feel like dragging three kids to the store to buy more. I have a batch on the stove right now. It looks and smells delish! Can’t wait til it’s cooled enough to use. Thanks for sharing! AH! Ya’ll are great. I recently realized I have a deadly soy allergy (found out in the nick of time, but still almost accidentally went into anaphalactic shock.) Anyway I’ve been seriously craving ketchup lately. I really appreciate this post! You are a lifesaver! My wife and I finally realized that she is allergic to soy (after 10 years). Your recipes are a God-send. I just made a batch of this and the taste is wonderful. I followed the way you make it exactly and will make it just this way again. Thanks so much for sharing this recipe. I needed to make my own due to a cinnamon allergy, thank you! Thanks for the recipe and the comment about freezing. We dont’ have any dietary restrictions, but try to eat “real food,” so every time I use commercial ketchup I think I need to learn to make my own. Then I don’t because I don’t use a lot of ketchup and don’t want it to go bad. For some reason, although I freeze a ton of things, it never occurred to me to freeze the extra. Last month I made my own Ketchup for the first time; it tasted wonderful, if I do say so myself. Nothing tastes as good as homemade.